One of the important habits of good oral health is daily tooth brushing with an effective toothpaste. There is a wide variety of toothpastes available. At Crabtree Dental in Katy TX, we recommend you use one with fluoride and make sure it has the ADA seal. This ensures that the toothpaste has been tested, claims are being met, and the ingredients are correct. 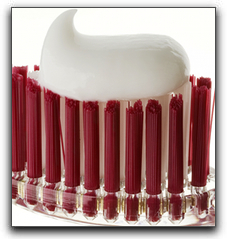 A toothpaste may have a ‘whitener’ in its ingredients, but that doesn’t mean it has fluoride. Toothpaste as we know it has only been in existence since the late 1800s. Fluoride was first added in 1914. The earliest evidence of toothpaste or dental cream dates back to 3000-5000 BC. The Ancient Egyptians pulverized oxen hooves, egg shells, pumice, myrrh, and water creating one of the earliest forms of toothpaste. Fortunately, there are a lot more flavors to choose from now, and a lot of different brands available. They’re all as close as the nearest grocery store. At Crabtree Dental in Katy TX, your dental health is out top concern. Services include general and family dentistry, and cosmetic dentistry. Schedule an appointment today.